Elle Magazine is famous for gracing it’s cover, with the most beautiful and talented women of the world, but this months issue of the Magazine, has its first ever Cover ‘Boy’. 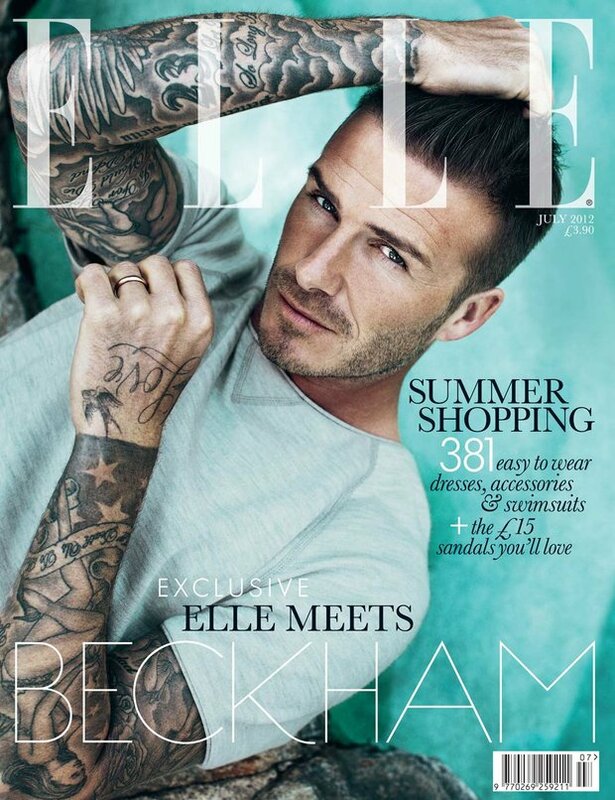 Causing a countrywide swoon fest, David Beckham is looking more handsome than ever on the cover of Elle Magazine UK. David Beckham Shows off his tattoo’s and athletically toned body in a fabulous blue tone, and black and white pictorial of the Galaxy FC Football player. Like fine wine Beckham seems to get better with age, and we think he has never looked better. If Beckham isn’t your usual cup of tea ladies, it would still be difficult to turn your head away from these pictures. The footballer, father of four and national heart throb graces ELLE’s July 2012 cover in a first for the magazine, their first ever ELLE Cover-Man. Inside the magazine is the full pictorial, along with an interview, where Beckham opens up about his wife, his children, and what is it like to be the most famous sportsman on the planet. ELLE made publishing history featuring Beckham as their first solo male cover star in anticipation of the 2012 Olympic games. David Beckham as been an ambassador of the London Olympics games 2012 since the very beginning, and was paramount in putting together the bid along with Sir Sebastian Coe. ELLE Editor in Chief Lorraine Candy said. And who are we to argue with that.